Do you trust pharmaceutical corporations? If your anything like me and have seen the massive conflicts of interest, skewed statistics, and profit-driven strategies used by pharmaceutical giants, you probably don't. While there are certainly pharmaceuticals that are indicated for specific disorders, and work well, it appears that the vast majority are prescribed as a means to greater profits, not better health. And everyone gets screwed by the high prices. Ever notice how many TV commercials are for prescription drugs? Since the advent of direct-to-consumer (DTC) marketing, pharmaceutical companies have been misleading millions of people. Using a combination of fear (medical condition so and so is often undiagnosed), making pharmaceuticals for banal conditions (restless legs? ), and getting consumers to pressure their doctor ("ask your doctor about ____"), pharmaceutical companies have effectively created a market for their products. I'm not much in to conspiracy theories, but I feel like I could write a sinister science fiction book about what goes on with pharmaceutical companies, economics, and politics. Here's what my book would be about: The food that the federal government subsidizes with our tax money happens to make us sick (corn, wheat, soy, veg oils), and then they tell us to eat it by making the "food pyramid", effectively institutionalizing poor nutrition. We eat the foods, get sick, and pharmaceutical companies sell us the drugs that supposedly cure these problems. As more people are at higher risk for getting sick, health insurance becomes a necessary service. Insurance companies will only pay for pharmaceuticals and surgeries, no prevention or diet based medicine there either... its a scary scenario. Not to mention that almost all of these problems can be avoided through a healthy diet and lifestyle in the first place. Unless you've been hiding in a cave, you've probably read about wikileaks in the news lately. Today a new development from the cables- Apparently the details of Pfizer's practices in Nigeria are getting out. In an article from the Guardian, "WikiLeaks cables: Pfizer 'used dirty tricks to avoid clinical trial payout", the US embassy cables reveal that some of the pharmaceutical giant's business practices aren't to wholesome. In 1996 Pfizer was sued by Nigerian state and Federal authorities for the deaths that occurred due to an antibiotic Pfizer developed and used in clinical trials in Nigeria. Last year Pfizer came to a tentative $75 million dollar settlement, but apparently didn't want to pay out the two cases- one civil and one criminal. So what does Pfizer do to get out of paying the settlement? They hire private investigators to uncover corruption links to the local Attorney General, and then start feeding the information to local media outlets. In short, Pfizer basically blackmailed Nigerian Government officials in to dropping the settlement payments for the deaths caused by Pfizer's clinical trials. 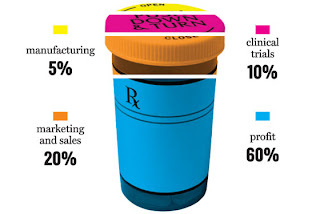 Does this inspire confidence in our pharmaceutical corporations? Excellent stuff. Thanks for this post, it made my morning! I do hate Big Pharma with a passion, however, I agree that medication can be beneficial applied properly. I often think of BP as a bit similar to Big Finance - financial products, instead of serving the needs of the real economy were (still are) being produced for their own sake. However, the conspiratorial angle here should be understood as a secondary/derivative feature. Primarily, what we have is an example of the way profit making enterprises can go from serving the needs of their clients to producing products and selling them for their own sake. Opinions and 'science' that keep profits happy thrive, while those that do not die out - this process can be an unconscious one, at least to begin with, evolving over time to produce some nasty structures and feedback mechanisms, with a logic and dynamic of their own. Out of this, a consciousness of self-interest can develop. At the later stages, evil, pure evil, can result (highlighted well with the examples from Pfizer that you provide). Anyway, we don't need a pharmaceuticals (and for that matter, insurance) *industry* - we need a real health service! Really excellent commentary! You draw the perfect parallel to the financial sector- how the products went from serving a need to serving themselves. I've been reading the book "Mistakes were made: but not by me",and it is the most insightful psychology book I've ever read. It explains the subject of cognitive dissonance and how people make a series of small self-justifications that can eventually lead them to making clearly wrong or unethical decisions- Extremely interesting and 100% applicable to health, nutrition, finance, etc. I'd like to hear more of your thoughts on this issue, If you'd like to write a guest commentary on the blog, send me an email at simmons.tyler@gmail.com.